India Pale Ale, Session beer, Imperial Porter, Blonde Ale - the varieties of craft beer styles is nearly endless. The craft beer industry is currently undergoing unprecedented growth across America. From Seattle to Miami microbreweries are revitalizing and reinventing beer as we know it, and industry experts expect the craft beer trend to stay relevant in the coming years. According to the Brewers Association, the nation's largest craft brew trade organization, an American craft brewer is "small, independent and traditional". The number of operating craft breweries reached an all-time high in 2016, with over 5,200 craft breweries throughout the country. In that year, California boasted over 600 craft breweries, the most of any U.S. state. 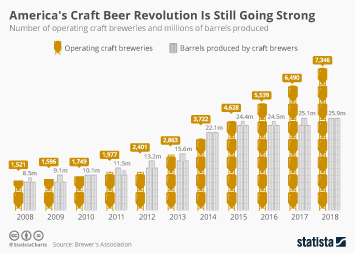 In terms of production, the craft beer volume amounted to about 30 million barrels in 2017. The most popular variety of craft beer is India Pale Ale, or IPA, with over one billion U.S. dollars in sales in 2016. In terms of brands, Blue Moon, Samuel Adams, and Sierra Nevada were the top three craft beer brands in the United States in 2017. However, the brands with the highest sales growth were Lagunitas, Deschutes, and Goose Island. Beer is the world’s most popular alcoholic beverage, with consumption suitable for various occasions at home, in restaurants, bars and clubs. Despite the rapidly growing craft beer market, light beer is still the most popular beer in America by a huge margin, showing that craft beer has yet to gain mainstream popularity. Perhaps it comes as no surprise that the age group that is most familiar with the term “craft beer” are Americans aged between 21 and 34 years, otherwise known as Millennials. Number of operating craft breweries in the U.S.
Retail dollar sales of craft beer in the U.S.